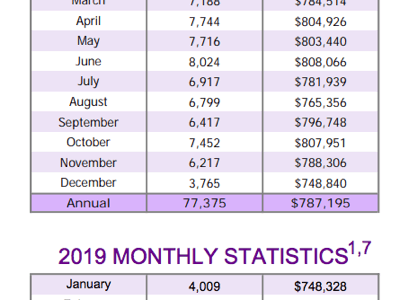 The Toronto Real Estate Board’s total sales for December - including all home types and all areas - staggered in at 3,781, down 22.5% YoY and the slowest December in 6 years. The overall average price was $750,180, a modest 2.1% rise. Six years prior - in December of 2012 - 3,690 homes sold at an average of $478,739. Those numbers were -19.5% and +6.5% YoY at that time, just for the record. Strength in Condo & Townhome prices in Metropolitan Toronto. Sales of Detached homes in Metro Toronto tanked 24.1% to 340 units at an average sale price of $1,145,892, off an even eight percent. In “The 905” - the balance of the Greater Toronto Area - 1,250 Detached homes sold, off 14.8%, at an average of $891,095, a 2.2% haircut from last December. All figures quoted here in are Year-over-Year [YoY] comparisons, unless otherwise specified. From the Spring of '17's average Detached price, December's Metro Toronto average represents a 27.4% drop. In the balance of the GTA, the current figures work out to an 18.9% drop. Also of note: The "premium" to own a Detached home in "The Big Smoke" is 28.6% versus the rest of TREB's market area. Tack onto that the double Land Transfer Tax. So, as Boomers age, many are moving further afield - often to Bungalows - and taking some tax-free cash off the table in the process... and some of the younger couples in Condos will probably decide to trade balconies for back yards - in or out of the City - as they begin to have children. Of course, the next stage of life for the Boomers will then be a Condo for many... And the "new" young adults will want those Condos. Whatever all that adds up to...merely observations... People will always buy and sell homes might be the bottom line, I suppose. Sales of Condominium Apartment units also nosedived but, again, that’s to some degree a function of constrained inventory. In Toronto, 848 units sold, down 23.9%, at an average of $594,381, up 11.4%. In the balance of the GTA, 337 sold, down 21.8%, at an average of $454,135, up 5.8%. No...not a “type-o”. “Whoa” as in “stop”. Or “slow down”, at least. Where are all the listings?! Is there really a “housing shortage”? Are home owners sitting tight waiting for prices to rebound? We’re not seeing line-ups at the new home builders’ sites these days… Maybe the market’s simply exahusted; consolidating from the frenzied buying of the past couple of years...? New listings in December were down 31.5% to just 4,308. Now, December’s notorious for being one of the slowest months of the year for home sales as folks’ attention turns to the Holidays and the heating bills. But inventory’s been an issue that not long ago was helping propel home prices - and sales, for that matter - unsustainably higher. It’s now contributing - to some degree - to lower sales...though also giving some support to prices. Go figure. Total Active Listings were down “just” 11.6% to 11,431 versus last December. That more moderate drop compared to “New” listings is also contributed to by the fact that homes are taking longer to sell at 31 days on the market - “15% slower” than last December’s 27 DOM. Forward Inventory [Total Active Listings / Sales] stood at three months compared to 2.62 months a year earlier. The Absorption Rate [Sales / New Listings] stood at .878 versus .779. “After spiking in 2017, new listings receded markedly in 2018. In many neighbourhoods, despite fewer sales from a historic perspective, some buyers still struggled to find a home meeting their needs. The result was a resumption of a moderate year-over-year pace of home price growth in the second half of the year. Price growth was strongest for lessexpensive home types, as many home buyers sought more affordable home ownership options.” - Jason Mercer, TREB’s Director of Market Analysis and Service Channels. “Higher borrowing costs coupled with the new mortgage stress test certainly prompted some households to temporarily move to the sidelines to reassess their housing options. With this said, it is important to note that market conditions were improved in the second half of the year, both from a sales and pricing standpoint.” - Garry Bhaura, Board President.